I was lucky enough to have spent my formative years living on the North Norfolk coast at Cromer. This was at a time when constraints on children were not so rigid as they are today. We passed our school holidays roaming at will, on the beach, in the woods and on the cliff tops. One day I received a warning from my grandfather about what he described as a huge black hellhound that also liked to wander the area, bringing death to any poor soul that happened to meet it. This creature is known in Norfolk by the name of Black Shuck. The secret of surviving an encounter with this hound was to avert your gaze; to look into his eyes – as big as saucers and glowing like burning coals – would mean certain death within the day. Being very young and impressionable I thought there might be an element of truth in what my grandfather had told me. He was after all a true Norfolk countryman wise in country lore. I naturally intended to avoid a meeting with the hound at all costs. Certain locations were avoided as the evening drew in, being considered high-risk areas. This fear was, however, at conflict with the curiosity of a young boy; the hope being that one day I might spot the creature from a point close enough to allow me to study it, but at a sufficient distance to protect me from the ill-effects. Needless to say I never did meet Black Shuck, but my interest in the story has never waned and I recently decided to conduct some research into the phenomenon. I was surprised to find that apparitions involving large black dogs are well documented in many parts of this country and abroad. These reported events are thought to have their origin in Norse mythology, the god Odin having a black hound as a companion in his kingdom, Asgard. The earliest written reference is in a French manuscript dated AD856. The writer describes how darkness enveloped a church during a service and a large black dog with glowing eyes appeared. It ran around the church as though searching for something and then vanished. A similar event, but with more serious consequences, involved the churches at Bungay and Blythburgh. On the morning of the 4th August 1577 the good folk of Bungay were worshipping in their parish church when there was a violent thunderstorm. As the storm raged outside, a large black dog ran down the aisle at great speed. It wrung the necks of two parishioners kneeling at prayer. Another unfortunate was struck on the back with great force causing a terrible burn injury. After this horrific visitation it was found that all the wheels and wires in the church clock were smashed. That same morning, the storm reached the church at Blythburgh where a service was being conducted. The great dog appeared on a main beam in the roof of the church; leaping down amongst the congregation it killed two men and a boy. Another person was badly burned but survived the encounter. The dog then left the building with a huge thundering sound. 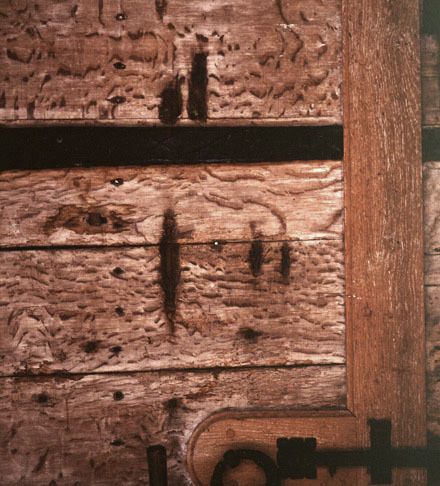 As a result of this visit the claw marks of the beast can still be seen to this day, on the inside of the north door of the church. It is of course far more likely that the lightning caused the damage and fatalities, not some ‘devil’ dog. How much easier though for the simple God fearing folk of that time to believe that the devil, rather than an act of God caused the terrible event. It also made a much more interesting tale for later generations to tell at the local inn on a dark stormy night. There is some speculation that the story of Black Shuck may have been the inspiration for Sir Arthur Conan-Doyle’s, The Hound of the Baskerville’s. The author did write to his mother from Cromer about this new book on which he was about to start work. It is more likely, however, that the idea came from similar folklore relating to the county of Devon where Conan-Doyle had a close friend. A contemporary novelist, Ian McEwan, also used the theme in a recent novel. Black Dogs, published in 1992, tells a sinister story of a woman’s encounter with the creatures whilst walking in an isolated part of southern France. McEwan studied at the University of East Anglia in Norwich. Did his inspiration come from the local legend of Black Shuck? A coastguard made the most recent report of a sighting of Black Shuck: the Eastern Daily Press of the 27th April, 1972 gave a full account of the event as described by Graham Grant, the officer involved. He was on night duty at the Gorleston rescue headquarters on April 19th at 0445hrs. “I saw a large black hound type dog on the beach, about a quarter of a mile north of the lookout. What made me look was that the dog was running then stopping, as if looking for someone. I watched it for one or two minutes and then it vanished before my eyes. I kept on looking for a time but it did not reappear.” Bulldozers had recently flattened the area of beach concerned, so there was nowhere for the dog to be lost to sight. “One moment it was there, the next it had gone”, said Mr Grant. Being recently transferred from another part of the country the officer had never heard the story of Black Shuck. A colleague, Mr Harold Cox of Cromer, related the legend to him after being told of the sighting. In recent years our attention seems to have turned from black canines to black felines roaming the Norfolk and Suffolk countryside. Strangely no one has ever managed to shoot one of these creatures, which I find a bit odd. In my experience, gamekeepers vigorously defend their game bird stocks and are very resourceful and skilful at dispatching predators. Surely by now one of these large cats should have been pictured in our newspapers, having been shot by someone defending their livestock. Perhaps the fascination with these black spectres from our very distant past has not gone away. Do we have some subconscious need for irrational belief in, and fear of, such nightmare creatures? Are the black, Puma like animals real, or are they our modern version of Black Shuck? There are several videos available about the legend of Black Shuck – I think that this one is perhaps the most evocative.